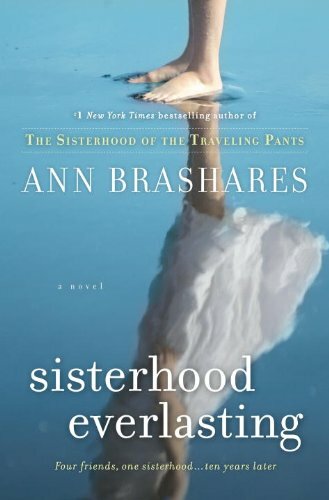 Goodreads says, "From #1 New York Times bestselling author Ann Brashares comes the welcome return of the characters whose friendship became a touchstone for a generation. Now Tibby, Lena, Carmen, and Bridget have grown up, starting their lives on their own. And though the jeans they shared are long gone, the sisterhood is everlasting. Despite having jobs and men that they love, each knows that something is missing: the closeness that once sustained them. Carmen is a successful actress in New York, engaged to be married, but misses her friends. Lena finds solace in her art, teaching in Rhode Island, but still thinks of Kostos and the road she didn’t take. Bridget lives with her longtime boyfriend, Eric, in San Francisco, and though a part of her wants to settle down, a bigger part can’t seem to shed her old restlessness. Then Tibby reaches out to bridge the distance, sending the others plane tickets for a reunion that they all breathlessly await. And indeed, it will change their lives forever—but in ways that none of them could ever have expected. As moving and life-changing as an encounter with long-lost best friends, Sisterhood Everlasting is a powerful story about growing up, losing your way, and finding the courage to create a new one." *Thankfully we don't have to wait too long for this one! I read and adored this series before I had this blog. I remember reading the entire series at the beach one summer. I can't wait to see what happens, especially now that the girls are older. This was my WoW pick a couple of weeks ago. I am really looking forward to it too. It sounds like a great summer book. yes! I am SO SO excited for this book!!! I miss them! I have been waiting for this book since last summer when I heard Brashares talk about it on one of her book tours. I cannot wait to see what is up with the girls ten years later. Great pick! I need to read these books, they seem like such fun reads. I'll have to wait until this one comes out and then I can read them all together. I'm not very patient with waiting for book releases! no way!! i had no idea about this one! thanks! What fun that they're back! I'm waiting on this one too. Looks awesome. Just pre-ordered my copy. I never got around to reading this series, but my mom and daughter love it! :) I know they'll be excited about this one! This series makes me remember summers, too. Such fun but meaningful books with amazing characters. I was so happy to hear this was coming out!